Aim: The purpose of this study was to evaluate the effectiveness of three desensitizing agents on dentinal tubule obliteration and their durability in use on the dentinal tubules. Materials and Methods: Sixty specimens were obtained from 30 extracted sound human maxillary first premolars. Each tooth was mesiodistally sectioned to obtain 30 buccal and 30 lingual surfaces, and enamel was removed in order to simulate hypersensitive dentin. Specimens were divided into four groups with 15 specimens each. Group 1 samples were immersed in artificial saliva, Group 2 samples were coated with Vivasens, Group 3 samples were coated with VOCO Admira Protect, and Group 4 samples were coated with Neo Active Apatite suspension. These specimens were examined under scanning electron microscope (SEM) to find out the occluding ability of the respective products. The specimens were brushed to find out their durability for 1 week and 1 month and were examined under SEM. Statistical Analysis: The results were statistically analyzed by analysis of variance (ANOVA) and Tukey's test. Results: Group 1 differed significantly from the Vivasens, Admira, and Neo Active Apatite groups at 5% level of significance (P < 0.05). The Vivasens group differed significantly from the Admira and Neo Active Apatite groups at 5% level of significance (P < 0.05). Conclusion: The Ormocer-based Admira Protect showed the best results. Several hypotheses have been advocated to explain how external stimuli may influence the nerve fibers, such as the direct stimulation theory, the odontoblastic transducer theory, gate control theory, and the hydrodynamic theory, among which the most widely accepted theory is hydrodynamic theory. According to this theory, the external stimuli cause a rapid flow of fluid in the dentinal tubules, activating the mechanoreceptors at the pulp/dentin interface, leading to pain. The treatment for dentinal hypersensitivity has been classified by mode of delivery  as at-home (patient-applied) therapy and in-office (professional/dentist-applied) therapy. There are many in vivo studies that have shown considerable decrease in hypersensitivity after using desensitizing in-office agents, but no in vitro studies have been conducted on desensitizing agents, and it has been proved from other studies that all the dentifrices and desensitizing in-office agents have the capacity for occluding dentinal tubules. However, no studies have been conducted to find out their durability. Durability is an important factor that helps us to know how long a desensitizing agent works on the obliteration of dentinal tubules, hence the present study was undertaken to evaluate the tubule-occluding ability and durability of three desensitizing agents, namely, Vivasens (Ivoclar Vivadent Inc., Schaan, Liechtenstein, Europe), Admira Protect (VOCO America Inc., Indian land, South Carolina, USA), and Neo Active Apatite suspension (nanohydroxyapatite) (Ghimas, Bologna, Italy). Vivasens and Admira Protect (Voco, Cuxhaven, Germany) were proved to be the best in treating dentin hypersensitivity as in-office desensitizing agents, but there is no literature which demonstrates the reduction of dentin hypersensitivity by occluding dentinal tubules. Neo Active Apatite suspension was considered to be the most biocompatible and bioactive material, which has promoted remineralization, but no studies were conducted to know the dentin tubule occlusion, thus these three materials were used to find out their tubule-occluding ability and durability. Vivasens, Admira Protect, and Neo Active Apatite suspension (nanohydroxyapatite) were used in this study. Sixty specimens were obtained from 30 extracted sound human maxillary first premolars that were extracted for orthodontic purposes and were stored in 10% formalin (pH 7); decayed teeth, fractured teeth, and teeth with malformations were excluded from this study. Each tooth was mesiodistally sectioned using a diamond wheel disk to obtain 30 buccal and 30 lingual surfaces. Plastic blocks 30 × 30 × 30 mm 3 were collected that were filled with plaster of Paris and specimens were placed in the plaster such that only the buccal and lingual surfaces were uncovered to prepare cavities on the cervical areas of each surface. Cavities of 2 mm depth and 3 mm width were prepared by using inverted cone bur (Dia-bur, Zhengzhou, Henan, China) on cervical areas of buccal and lingual surfaces and sectioned to obtain 5 × 5 × 3 mm 3 blocks. These blocks were polished by abrasive paper (600-1200 grit, SS White, Gloucester, England) in order to expose the dentin surface. Blocks were kept in 17% ethylenediaminetetraacetic acid (EDTA) for 40 min in order to completely open the dentinal tubules. These blocks were ultrasonicated in distilled water for 12 min to remove the residual smear layer. All the specimens were processed and examined under the scanning electron microscope (SEM; IICT, Hyderabad, India) to observe the opening of the dentinal tubules to simulate hypersensitive cervical dentin. After SEM analysis, the specimens were washed and stored in artificial saliva. Group I: 15 buccal surfaces were immersed in artificial saliva (control group). Group III: 15 buccal surfaces were coated with Admira Protect. Group IV: 15 lingual surfaces were coated with Neo Active Apatite suspension. Group I: Specimens were immersed in artificial saliva for 7 days. These samples were not treated with any desensitizing agents but kept in artificial saliva. The artificial saliva contained (mmoles/L): Distilled water 700 mL, Ca(OH) 2 1.56 mM, KCl 150.00 mM, HCl 36.00 mM, H 3 PO 4 0.088 mM, buffer 99.7 mM, pH 7.2. Group II: Specimens were treated with Vivasens. According to the manufacturer's instructions, Vivasens was applied on the dentin surfaces with the help of disposable brush for at least 10 s.
Group III: Specimens were treated with Admira Protect. According to the manufacturer's instructions, Admira Protect was applied with a fine application brush such as Micro Tim (VOCO America Inc., Indian land, South Carolina, USA) evenly on all dentin surfaces, allowed to act for 20 s, and light-cured. Group IV: Specimens were treated with Neo Active Apatite hydroxyl suspension, which was applied with brush for 10 s.
These specimens were mounted on metal stubs, kept in oven at 37°C for 2 h, and stored in vacuum silica gel dessicator for another 2 h; the samples were sputter-coated with 25 nm of gold for 10 min. All the specimens were examined under the SEM (IICT, Hyderabad, India) to check obliteration of the dentinal tubules. After SEM analysis, the specimens were placed in artificial saliva. All the specimens were brushed twice daily for 7 days and 1 month for 2 min at a load of 250 g with oscillations of 6800 strokes per minute with the help of toothbrush machine  (custom-made). In between, the samples were stored in artificial saliva. Finally, the specimens were examined under SEM for durability [Figure 1]. Mounting on metal stub, keeping in oven at 37°C, storing in vacuum silica gel dessicator, and sputter-coating with 25 nm of gold never affected the durability of the desensitizing agents used in this study. Unoccluded (0%, no tubule occlusion). The mean score of tubule occlusion by the two blinded observers was taken and used for analysis. Group I (control group) differed significantly from the Vivasens, Admira, and Neo Active Apatite groups at 5% level of significance (P < 0.05): The mean values were significantly larger in the control group as compared to the Vivasens, Neo Active Apatite, and Admira groups. Group II (Vivasens group) differed significantly from the Admira and Neo Active Apatite groups at 5% level of significance (P < 0.05): The mean value was significantly larger in the Vivasens group as compared to the Neo Active Apatite and Admira groups. Group III (Admira group) differed significantly from the Neo Active Apatite group at 5% level of significance (P < 0.05): The mean value was significantly larger in the Neo Active Apatite group as compared to the Admira group. Precipitation of proteins and calcium crystals occurs when desensitizing agents are used. However, the mechanism of action of desensitizing agents is not understood. This study sought to evaluate in vitro agents that are utilized in treating dentin hypersensitivity in terms of their dentinal tubule occlusion and their durability using SEM analysis. In-office agents were used because there are only a few studies conducted in vitro and theoretically, in-office desensitizing therapy provides immediate relief from symptoms of dentin hypersensitivity. The materials used in this study are Vivasens, Admira Protect, and Neo Active Apatite suspension (nanohydroxyapatite). Apatite Neo Active Suspension is a fluid desensitizing gel, made from crystalline hydroxyapatite developed by Ghimas; it is 70-100 nm in measurement, highly resistant to acids in the oral cavity, penetrates deeper into the tubules, and helps by providing protection from acids. The product is composed of a suspension of nanohydroxyapatite in absolute alcohol. The hydroxyapatite is produced according to a technique developed by Ghimas, and it has structural, dimensional, and biofunctional characteristics that replicate those of the natural dentin. The biometric nanohydroxyapatite bonds to the collagen fibrils present on the surface of the dentinal tubules, occluding them, and as a result reduce or eliminate pain-inducing stimuli. The active nanohydroxyapatite occludes any open orifices of dentinal tubules, resists attack by acids present in the oral cavity and when applied on the affected tooth it penetrates into the dentin, thereby protecting it. In the current study, only the number of patent dentinal tubules was counted. The results showed that all three desensitizing agents relatively showed dentinal tubule occlusion, despite their different chemical compositions and application procedures. However, after brushing for 1 week and 1 month, the mean tubule openings were larger in the control group as compared to the Vivasens, Neo Active Apatite, and Admira groups, so the control group (Group I) differed significantly from the Vivasens, Admira, and Neo Active Apatite groups at 5% level of significance (P < 0.05). Group II, that is, the Vivasens group, showed a greater number of opened dentinal tubules after brushing when compared to Group III and Group IV. The Vivasens group differed significantly from the Admira and Neo Active Apatite groups at 5% level of significance (P < 0.05). This means that the mean value was significantly higher in the Vivasens group as compared to the Neo Active Apatite and Admira groups. Group III, that is, the Admira group showed the lowest number of opened dentinal tubules when compared to Group I, Group II, and Group IV. That is, the Admira group occluded dentinal tubules well even after 1 week and 1 month of brushing when compared to Group I, Group II, and Group IV. The Admira group differed significantly from the Neo Active Apatite group at 5% level of significance (P < 0.05). This means that the mean value was significantly higher in the Neo Active Apatite group as compared to the Admira group. The Neo Active group, that is, Group IV, showed a higher number of opened dentinal tubules when compared to Group II and Group III; from the results, Group III, that is, the Admira group showed the best results by occluding a higher number of dentinal tubules after brushing for 1 week and 1 month. In the present study, 60 specimens were obtained from 30 extracted sound human maxillary first premolars. Each tooth was mesiodistally sectioned using diamond wheel disk to obtain 30 buccal and 30 lingual surfaces on each of which a cavity of 2 mm depth and 3 mm width was prepared on cervical areas and sectioning was don to obtain a 5 × 5 × 3 mm 3 block. These blocks were kept in EDTA to completely open the dentinal tubules and were examined under SEM. All the blocks showed opening of dentinal tubules on SEM analysis. Specimens were randomly divided into four groups with 15 specimens each. All these specimens were treated with respective desensitizing agents and were examined under SEM, and all the specimens showed complete closure of dentinal tubules under SEM. After application with the respective agents, all the specimens were brushed twice daily for 2 min with oscillation of 6800 strokes per minute for 1 week with customized toothbrush and were again examined under SEM, and brushing was continued twice daily for 2 min with oscillation of 6800 strokes per minute for 1 month with customized toothbrush and again examined under SEM. Specimens were brushed twice daily for 2 min with oscillation of 6800 strokes per minute for 1 week and 1 month to know the durability of desensitizing agents used in this study. Anything can occlude dentinal tubules, and many studies have been conducted on dentinal tubule occlusion, but no studies have been conducted to know the product's durability. Thus, the present study was conducted, and it gives information about dentinal tubule occlusion by different desensitizing materials and also about their durability. In this study, all the three desensitizing agents relatively showed dentinal tubule occlusion, but Ormocer-based Admira Protect showed the best durability when compared to other products when brushed twice daily for 2 min with oscillation of 6800 strokes per minute for the 1 week and 1 month evaluation period. Ormocer-based Admira Protect showed definite potential as an effective and permanent desensitizer when used as an in-office agent; however, further long-term studies and comparative clinical trials with other popular desensitizing methods need to be carried out to prove its superiority. All the three desensitizing agents demonstrated dentinal tubule occlusion despite their different chemical compositions and application procedures. Ormocer-based Admira Protect showed definite potential as an effective and permanent desensitizer when used as an in-office agent in the 1 week and 1 month evaluation period. Erdemir U, Yildiz E, Kilic I, Yucel T, Ozel S. The efficacy of three desensitizing agents used to treat dentin hypersensitivity. J Am Dent Assoc 2010;141:285-96.
de Souza AM, Colares RC, Mendonça JS, Rodrigues LK, Santiago SL. Effect of oxalic acid pre-treatment in restorations of non-carious cervical lesions: A randomized clinical trial. J Conserv Dent 2014;17:427-31. Madhavan S, Nayak M, Shenoy A, Shetty R, Prasad K. Dentinal hypersensitivity: A comparative clinical evaluation of CPP-ACP F, sodium fluoride, propolis and placebo. J Conserv Dent 2012;15:315-8. Jena A, Shashirekha G. Comparison of efficacy of three different desensitizing agents for in-office relief of dentin hypersensitivity: A 4 weeks clinical study. J Conserv Dent 2015;18:389-93. Lee BS, Kang SH, Wang YL, Lin FH, Lin CP. In vitro study of dentinal tubule occlusion with sol gel DP-bioglass for treatment of dentin hypersensitivity. Dent Mater J 2007;26:52-61. Ozen T, Orhan K, Avsever H, Tunca YM, Ulker AE, Akyol M. Dentin hypersensitivity: A randamized clinical comparison of three different agents in a short term treatment period. Oper Dent 2009;34:392-8. Pinto SC, Pochapski MT, Wambier DS, Pilatti GL, Santos FA. In vitro and in vivo analysis of desensitizing agents on dentin permeability and dentin tubule occlusion. J Oral Sci 2010;52:23-32. Brahmbhatt N, Bhavsar N, Sahayata V, Acharya A, Kshatriya P. A double blind controlled trial comparing three treatment modalities for dentin hypersensitivity. Med Oral Patol Oral Cir Bucal 2012;17:e483-90. de Assis Cde A, Antoniazzi RP, Zanatta FB, Rösing CK. Efficacy of gluma desensitizer on dentin hypersensitivity in periodontally treated patients. Braz Oral Res 2006;20:252-6. Dilip Pol G, Jyoti J, Mukesh C, Tanay G. Current strategy in the management of dentinal hypersensitivity. JIDA 2011;5:236-45. Santiago SL, Pereira JC, Martineli AC. Effect of commercially available and experimental potassium oxalate-based dentin desensitizing agents in dentin permeability: Influence of time and filtration system. Braz Dent J 2006;17:300-5. Chen CL, Parolia A, Pau A, Celerino de Moraes Porto IC. Comparative evaluation of the effectiveness of desensitizing agents in dentine tubule occlusion using scanning electron microscopy. Aust Dent J 2015;60:65-72. Dundar A, Yavuz T, Orucoglu H, Daneshmehr L, Yalcin M, Sengun A. Evaluation of the permeability of five desensitizing agents using computerized fluid filtration. Niger J Clin Pract 2015;18:601-6. Ferrari M. The morphocologic relationship between resin and dentin in Class V restorations: An in vitro and in vivo investigation. Quintessence Int 1994;25:621-5. Oberg C, Pochapski MT, Farago PV, Granado CJ, Pilatti GL, Santos FA. Evaluation of desensitizing agents on dentin permeability and dentinal tubule occlusion: An in vitro study. Academic Of General Dentistry 2009;57:497-501. quiz 502-3, 535-6. Ide M, Morel AD, Wilson RF, Ashley FP. The role of dentin-bonding agent in reducing cervical dentin sensitivity. J Clin Periodontol 1998;25:286-90. Absi EG, Addy M, Adams D. Dentin hypersensitivity, A study of patency of dentinal tubules in sensitive and non-sensitive cervical dentin. J Clin Periodontol 1987;14:280-4. Ibrahim MA, Banna ME. Evaluation of the sustainability of different desensitizing agents after in-office bleaching. Life Sci J 2011;8:121-34. Atassi F, Baby N. Obturation of dentinal tubules in treatment of root sensitivity an invitro scanning electron microscopic study. Indian J Dent Res 1997;8:47-51. Miglani S1, Aggarwal V, Ahuja B. Dentin hypersensitivity: Recent trends in management. J Conserv Dent 2010;13:219-24. 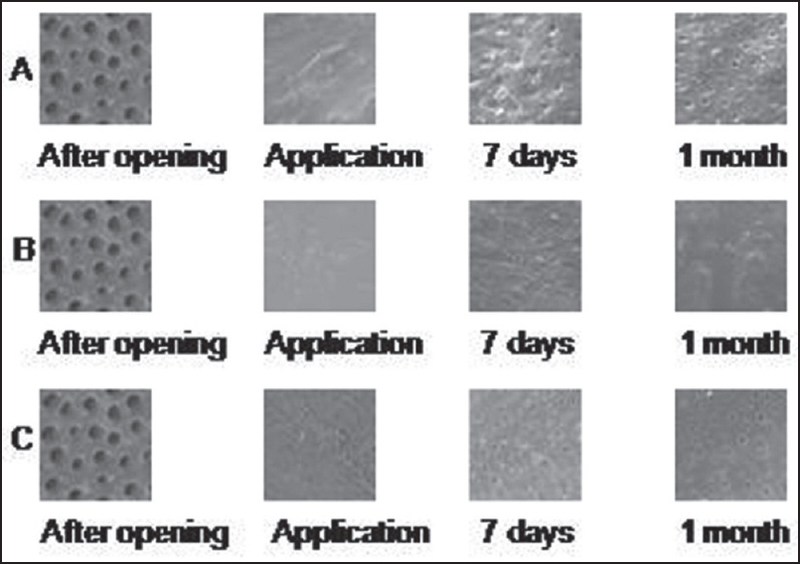 Makkar S, Goyal M, Kaushal A, Hegde V. Effect of desensitizing treatments on bond strength of resin composites to dentin - An in vitro study. J Conserv Dent 2014;17:458-61. Al-Saud LM, Al-Nahedh HN. Occluding effect of Nd: YAG laser and different desensitizing agent on human dentin in vitro scanning electron microscopic investigation. Oper Dent 2012;37:340-55. Kolker JL, Vargas MA, Armstrong SR, Dawson DV. Effect of desensitizing agents on dentin permeability and dentin tubule occlusion. J Adhes Dent 2002;4:211-21. Lee SY, Kwon HK, Kim BI. Effect of dentinal tubule occlusion by dentifrice containing nano-carbonate apatite. J Oral Rehabil 2008;35:847-53. Malkoç MA, Sevimay M. Evaluation of mineral content of dentin treated with desensitizing agents and neodymium yttrium-aluminium-garnet (Nd:YAG) laser. Lasers Med Sci 2012;27:743-8. Santamaría KS, Jorge GF. Efficacy of two dentinal desensitizing agents after periodontal treatment. J Clin Perodontol 2010;29:501-6. Shetty S, Kohad R. Hydroxyl apatite as an in office agent for tooth hypersensitivity clinical and scanning electron microscopic study. Oper Dent 2011;6:334-9.